Winter has arrived and with him he has brought back moisture and rain. Who says winter, often says trush of frog! For owners who are looking for an effective remedy against fork rot, I offer several recipes other than the famous Norwegian tar. First of all, you can use in prevention of rot, cider vinegar (bio is better) to which you add essential oils of tea tree (1l of cider vinegar for 30 taste of essential oil of tea tree). Indeed the cider vinegar associated with the Tea Tree will allow to disinfect the gaps and therefore remove the pests. First, you have to clean your fork and wait for it to dry. You can also insert one day on two with oxygenated water that will dry out the fork and then you will be able to disinfect. If you see that your frog begins to become deeper or even that it doesn’t smell good then there are other effective and natural remedies that you can order on the Internet or do it yourself. unpasteurized Honey: Curative antimicrobial properties and sticky consistency. Zinc oxide: Antimicrobial powder and aid to the healing process. Natural fibres: Allows the product to be kept in contact with infected tissues and the fibres also maintain a useful pressure on the tissues to promote the development of healthy tissues. To apply it: Clean the lesion to be treated properly by irrigating if necessary to remove all debris. 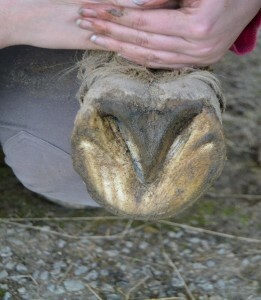 Take with the help of a clean foot cure of the fibers of Hoof Stuff and stuff them into the lesion (if there is a sensitivity, do not insist). Let some fibers out to be able to remove the product more easily. After 24h, remove the fibers from Hoof Stuff, if these fibers are clean, you can position new ones and leave them in place longer. On the other hand if the fibers are soiled, renew more frequently. The time between 2 replacements depends also very much on the environment. There is a natural recipe that you can make yourself at home. Before putting it on your fork, always think about cleaning thoroughly with a warm water bath where you can put cider vinegar or baking soda in order to disinfect. Then apply your mixture to the gaps and let dry in the open area and on dry soil if possible. Renew the application every day so that it is effective until you notice an improvement. This product is to be kept free from cold and heat and is strictly reserved for external use. 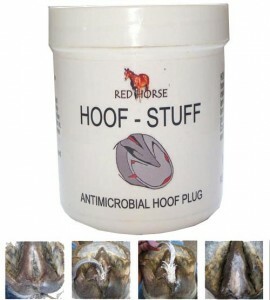 Here are some products that you can test on the forks of your equine. In my opinion, there will never be a miracle product to cure its rots. A small tip despite everything, avoid chemicals see harmful to the clogs of your mount, choose a natural product that you can do yourself at home and that will be even more economical for your wallet. Ask yourself the question, why is my horse rotting? 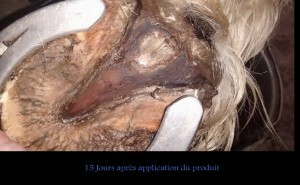 This is not only due to the weather, it can also come from the moral and physical health of your horse simply. It’s up to you to see where the problem can come from.